During a portion of President Reagan’s second term, I worked Sundays. On more than one occasion, I got assigned to report on the Easter sunrise service at the top of Stone Mountain. I typically rolled out of bed and drove straight to Stone Mountain, where I would meet a photog whose lack of seniority mirrored my own. One year, I showed up and the photog didn’t. I got on the last tram to the summit and watched the service. The photog never showed up. Later, he reported his vehicle had broken down en route to Stone Mountain Park. I heard this at about 9am, after returning to the station empty-handed, four hours deep into my Sunday shift. The photog exchanged his truck, and we embarked on another assignment: A church fire in Carrollton. We drove the sixty or so miles to our destination. When we arrived in the church parking lot, the photog looked in the back of his truck and exclaimed: “Well, goddamn. No deck.” He’d forgotten the separate 3/4″ tape deck that recorded video for his camera. We went back to Atlanta empty-handed. By noon, he and I had been assigned to cover a third story. Can’t remember what it was. It was a hell of an Easter, and my travails that day very nearly permanently scarred my attitude toward the holiest day in Christendom. While you ponder your contributions to today’s Friday Open Thread, consider perusing this site. 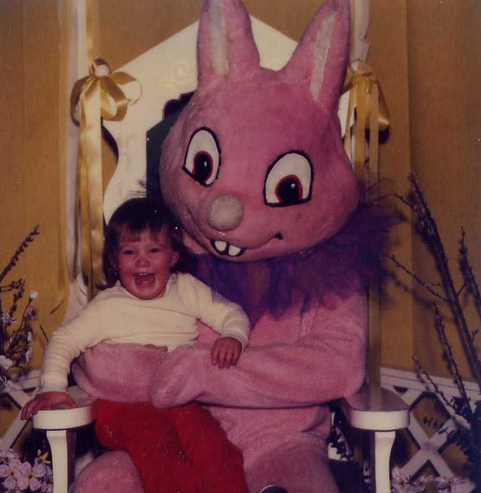 Its title is “the 65 sketchiest Easter bunnies,” from which the two photos herein are sampled. 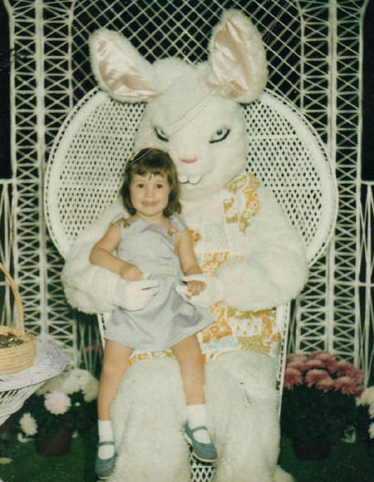 This video by Aphex Twin, which features an evil TV set, would provide a suitable soundtrack for your views of the 65 Sketchiest Easter Bunnies. Afterward, come sit in LAF’s lap and whisper something in the comments section. You have nothing to fear. This entry was posted in Friday Open Thread on April 2, 2010 by live apt fire.